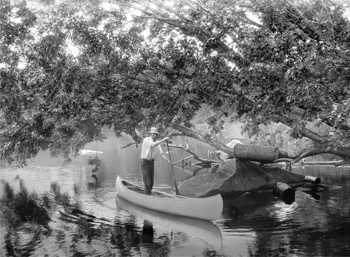 Island Falls Canoe was started in 1972 by Clint Tuttle who put the classic wooden forms of the White Canoe Company, which had sat idle for over a decade, back into use, and the beautiful E.M. White designs back into production. 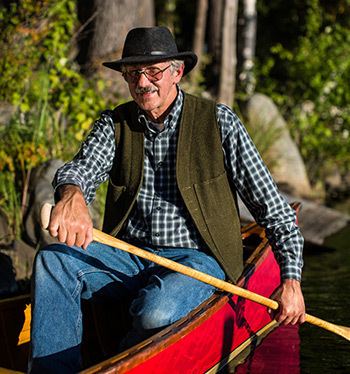 In 1975 Jerry Stelmok purchased the Island Falls Canoe Co. from Clint and along with Rollin Thurlow of Northwoods Canoe, gradually increased the awareness of these fine wood and canvas canoes and increased production. Today Island Falls Canoe produces a number of E.M. White original designs, and our own adaptations of White classics, using the finest native white cedar, quality woven canvas, traditional bronze and brass fastenings, and the finest traditional paints and varnishes. He has had a hand in the building of over 800 new canoes, dinghies and models. Has published numerous articles as well as two books on canoe building and co-authored a third. He and his work have been featured in numerous publications including Wooden Boat, Wooden Canoe, Canoe and Kayak, American Craft, Traditional Home, Maine Boats, Homes and Harbors and Yankee. Jerry has also helped over one hundred individuals build their own canoes at the Island Falls Canoe Shop. Over the years he has taught hundreds of students at programs at schools and museums, including the Center for Wooden Boats, Seattle Washington, The Adirondack Museum, Michigan Maritime Museum, Maine Maritime Museum, and the Chesapeake Maritime Museum. And he has taught at the Wooden Boat School at its lovely Brooklin waterfront campus in Maine for 27 years. 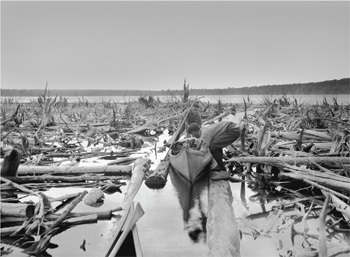 He has been a charter member of the Wooden Canoe Heritage Association (WCHA) since its start in 1978. Currently Jerry and Island Falls Canoe is under contract with Old Town Canoe to produce their wood canvas canoes as well as supply materials for those restoring Old Town wood canvas canoes of their own. 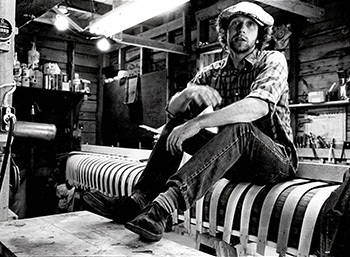 Mostly Jerry loves wood and canvas canoes and all they stand for and has built his life around paddling, building, and writing about them, using them as subjects in his artwork and helping others build and restore their own. He is joined by his partner, Andrea “Andy” Myers, whose ability and efficiency have been major contributions to all phases of this chosen lifestyle for many years. 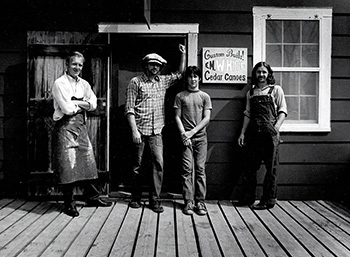 Island Falls Canoe founder Clint Tuttle in the tiny shop in Island Falls, Maine around 1970 and on the deck of the Island Falls shop with friends and helpers. 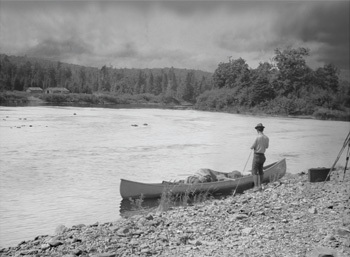 One of the earliest and most respected builders of these "new" wood canvas canoes was Edward M. White who, around 1885, set up a shop at his home in Gilman Falls, Maine, using machinery powered by a horse on a treadmill. In 1889, he opened a large, new factory on Water Street in nearby Old Town from which his canoes were sent to destinations around the nation and the world. 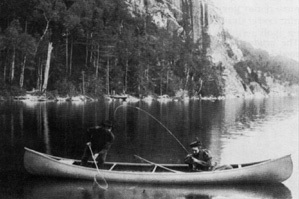 White's earliest and most successful canoes were based on the time-proven designs of the Penobscot and Malecite Indians, and quickly made a favorable impression on serious guides, woodsmen and sportsmen. 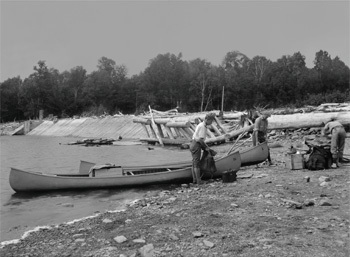 White's guide model set the standard for safe, dependable, good-looking, working canoes. 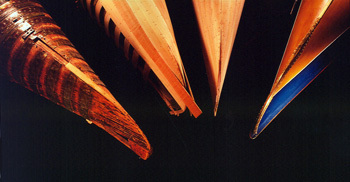 The business prospered during the heyday of recreational canoes through the 1920s and held its own through the Great Depression and World War II until the early 1960s when competition from aluminum canoes and a decline in the market forced the owners to abandon the wood canvas models in favor of the more widely sought after fiberglass canoes. In 1984 the White Canoe Company was purchased by Old Town Canoe, who until 1990 offered a line of White synthetic canoes. 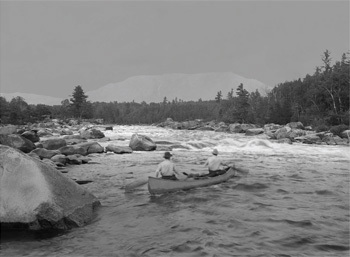 The images below of E.M. White canoes being used by old time Maine guides were captured by famous central Maine photographer Albert Lincoln Call (1866-1965) who made his first photographic forays into Maine's north woods in 1888. The "Bert Call" collection assembled by historian Frank Spizuoco at the Dexter Historical Society contains hundreds of extraordinary photographs. 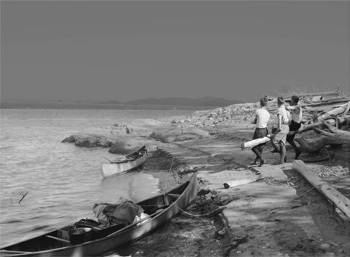 A traveling exhibit of striking Bert Call images restored by Todd Watts is scheduled by Frank at the website: http://www.call-thoreau-exhibit.bertlincolncall.com. The following images are copyright © 2009 Dexter Historical Society. I am sitting here staring at my 1997 Willow Wisp. I just finished putting shellac on the bottom for the 4th time. Literally the only maintenance I have had to do in the past 9 years. One hours work every two years. And many paddlers still worry that a wood/canvas canoe will require constant maintenance and upkeep. Even in my less than gentle hands, my canoe has held up to rocky rivers, dodging ice flows, and hopping around the Great Lakes. It is beautiful beyond compare, paddles like a dream, and is the envy of all my paddling friends.